A Kansas City church is caught in the middle of a liquor license dispute and the head pastor isn't happy about it. KANSAS CITY, Mo. — A Kansas City church is caught in the middle of a liquor license dispute and the head pastor isn't happy about it. Highland Missionary Baptist Church is named on the liquor license for Shotz Convenience Store & Grill twice. Pastor John Jones says the church's name was put on the license without his knowledge or approval. "That was a shock to me, I did not realize that. I'm most definitely upset by it," Jones said. It all started when Shotz owner Michael Thomas applied for a liquor license for his store at the corner of 27th and Benton. Thomas took part in a months long process to petition the community for a liquor license. Part of that process was speaking to Pastor Jones because the church is about half a block north of the store. Thomas told Jones he'd only sell beer and wine at the store for the first year to prove alcohol sales wouldn't cause a problem in the neighborhood. What neither Thomas nor Jones expected was Kansas City's Regulated Industries included that 2017 "gentleman's agreement" as part of the Shotz liquor license. As a result, Regulated Industries gave Thomas a conditional license to sell beer and wine not to exceed 14 percent in alcohol volume. "And they took a gentleman's agreement and made it a legal and binding document without even our signature," Thomas said. Specifically, the license puts the church in the position of either lifting or not lifting the restriction on hard liquor sales. "Authorization from the current Head Pastor of the Highland Missionary Baptist Church is required in order to lift the restriction. The authorization to lift the restriction by the Highland Missionary Baptist Church must be submitted in writing to the Regulated Industries Division Manager for authentication and the formal revocation of the Conditional License," the Shotz liquor license states. Thomas doesn't think the church should be involved in regulating his business. "No, churches don't pay taxes for one," he said. "We want to see him be successful. But at the same time, we don't want our name on any liquor license or anything like that because we have nothing to do with that," he said. What makes the church's reference on the liquor license so distasteful to Jones is the church's covenant specifically states "to abstain from the sale of, and use of destructive drugs or intoxicating drinks as a beverage". When the Shotz conditional liquor license expired November 30, Thomas thought it meant he could sell hard liquor. He says he needs to do it to compete with neighboring businesses. But after briefly selling hard liquor, Regulated Industries shut him down. Not only did Thomas buy hard liquor, he also paid for advertising promoting the sale. "I paid for a full liquor license which what I'm getting does not consist of a full liquor license. Thomas says he borrowed $15,000 to buy hard liquor. There are boxes filled with liquor throughout the store. But Thomas currently can't sell any of it. As a result, he says he's laid off one cook, cut back store hours and also cut back on supplies he buys from vendors. "If I didn't own the property, I'd already be gone," Thomas said. Regulated Industries' Jim Ready says he specifically added the passage on the Shotz license requiring the church to lift the hard liquor sales restriction. Ready says part of the solution is to have Pastor Jones write a letter stating his church doesn't want to regulate the business. But Pastor Jones already is on record making that same statement to Regulated Industries two years ago. In a letter dated Jan. 17, 2017, it states the church "will honor whatever decision is made by the community." Jones has no intention of writing another letter as Ready wants. "I can not sign a paper stating to Regulated Industries that I support the sale of hard liquor," Jones said. Ready says the other part of the solution is for Thomas to re-petition the neighborhood to get a full liquor license. But Thomas says he shouldn't have to do that time-consuming exercise again and believes he'd be out of business before he could complete that task. "Probably two to three months with the way I'm structured now," he said. 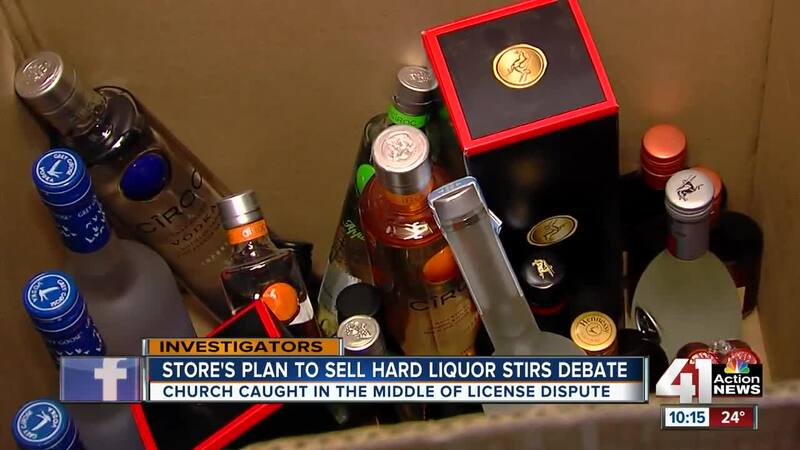 While Pastor Jones can't condone the sale of hard liquor, he also believes Thomas should be able to compete on an even playing field with other nearby stores which do sell hard liquor. Jones definitely doesn't want Thomas to close Shotz. Jones says before Thomas opened his store, there was drug activity outside the building. Since Shotz has been there, Jones says Thomas has run the store with the highest integrity, including policing the area to keep it free of vagrants and drug dealers. "I know that corner, if it's empty, than we got a problem," Jones said. "I mean I've put everything I have in here in the last 10 years," Thomas said. Ready says Shotz has one of about 100 conditional liquor licenses in Kansas City.